A few years ago I thought I had a brilliant idea. I created a master writer’s notebook since my notebook writing, which I shared with students during writing conferences and in minilessons, was spread out in several writer’s notebooks. Instead of carrying multiple writer’s notebooks with me when I conferred, I thought it would be easier to have a master notebook. However, recopying old entries into one master writer’s notebook was tedious. I gave up on my idea when the master notebook broke apart and went back to schlepping a few notebooks around with me whenever I conferred with students. In late December I looked at the bookshelf in my office that holds many of my writer’s notebooks. 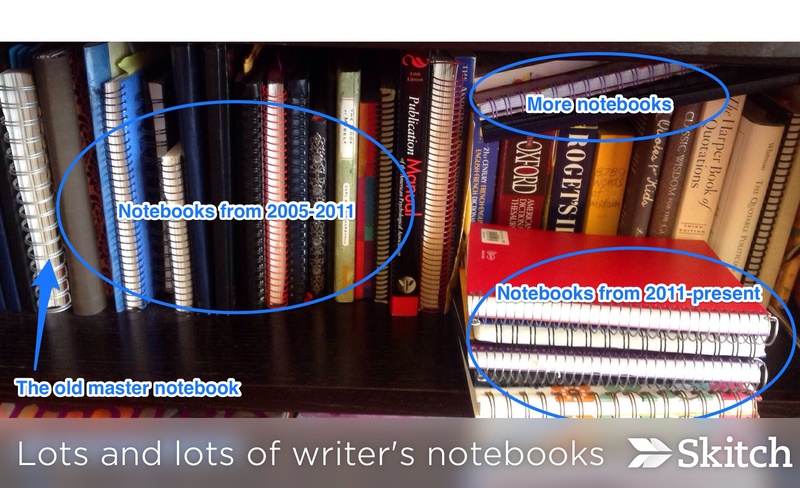 I noticed I’ve amassed a lot of writer’s notebooks in the past decade (see photo). The “master writer’s notebook” sat among the notebooks filled with writing. I looked at it and sighed. A few minutes later I thought about creating a digital master writer’s notebook. I opened Evernote and created a new notebook called “writer’s notebook.” Then, I read through my old notebooks in search of my favorite entries. I photographed writer’s notebook entries using the document camera feature in Evernote. Next, I applied tags to each entry based on the audience I could share it with (i.e., elementary school, middle school, adult audience, or general). I also added tags like “boxes and bullets,” “graphic organizer,” “literary essay,” “poetry,” and “writing exercise.” This gives me a variety of ways to search for entries when I need them. It’ll take me awhile to go through all of my notebooks to put everything I need into Evernote. But for now, I have a master writer’s notebook in Evernote, which means I can access my notebook writing on my iPhone, on my iPad, and from my computer. Now I can bring my iPad into a classroom and confer with student writers. I don’t have to worry about bringing several writer’s notebooks with me since everything is in one place. All I have to do is open the “writer’s notebook” notebook in Evernote or do a keyword search for a given entry. Then I can show a student a writer’s notebook entry during a writing conference. I can also e-mail it to someone if the student needs or wants to use it as a mentor. Finally, I want to give a hat tip to Mary Bellavance, Susan Dee, Deb Frazier, Katie Keier, Cathy Mere, and Karen Terlecky. These ladies led an incredible round table session at NCTE, which had me thinking about digital tools for the past two months. Thank you for the inspiration! What a great idea, Stacey. Thanks for sharing. Thank you SO much! What a great way to tie together notebook writing and technology, making it easier to teach. Need to get myself organized! Evernote has become both a professional and a personal resource of great value to me. My kid’s portfolios, parent notes, recipes, lists, presentations…everything is in EN. I have not put together writer’s notebook pieces, however. Many of those are in big books I keep and share with my kids. Thank you for the idea. This would be a great place to store photos of mentor text exerpts to share as well. One more great way to use Evernote. Thanks! This is a great resource, Stacey! Thank you for sharing. Perfect! I was just looking at my shelf of notebooks and wondering how I could gather what is important and get rid of the rest since my notebooks hold schedules, thoughts and writing. I have not worked very much with Evernote but will go exploring this weekend and see what I can learn. Thanks for the timely post! Love the idea! What a great idea! Evernote is my go to program for conferring, so logically I could integrate this idea into my lessons. This is so awesome! It is motivating to see what you have done so far and how quickly you can have what you need at your fingertips. What a fabulous idea, Stacey! I gave up on Evernote…but I definitely see that I need to revisit it! Love this! I started writer’s notebooks with my first graders this week. I forgot my notebook at school, but was able to pull it up on my blog and share a few entries I had written about. The lesson went off perfectly. This idea of collecting them in a notebook is perfectly timed. I think I will also begin collecting entries from students that may be helpful in the future. Thanks for the push. What a great post! I use Evernote, too, but definitely not nearly enough! I’m relaunching the Writer’s Notebook this week, so this will be a great tool! Thanks again! Great idea! You could also search tags while conferring to bring up other great examples of a specific strategy. Imagine if students also had access to Evernote and learned how to tag effectively – they could efficiently search and find inspiration – from their own writing! Now that would be a great use of Evernote too! Well, this is smart! I’m caught in a paper vs. paperless limbo right now, and this post has me thinking maybe Evernote will help me make the final leap. 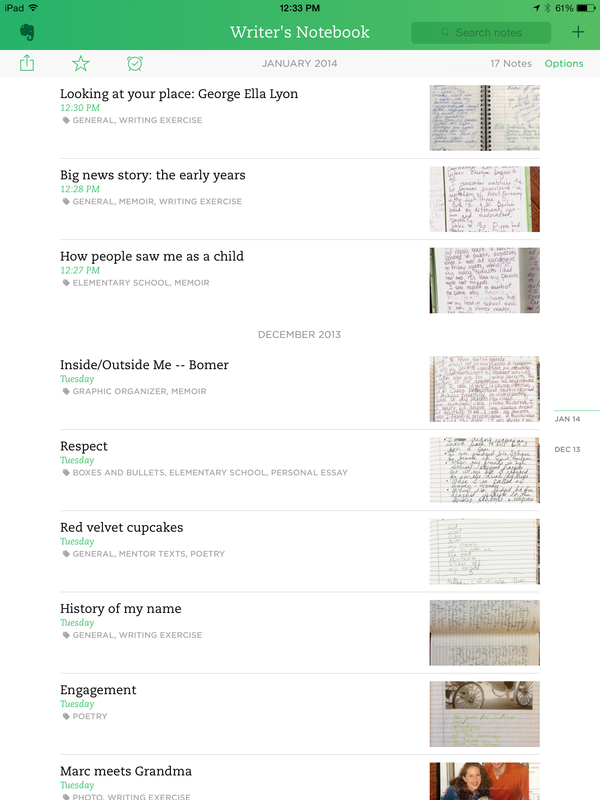 I’m on the verge of digitizing my life with Evernote. My office is a heap of papers, which is not conducive to writing well. Therefore, I’m thinking of photographing and scanning everything so I can store it on a cloud instead of around my body! LMK how it goes for you, Dana. Great post! Thanks for sharing. 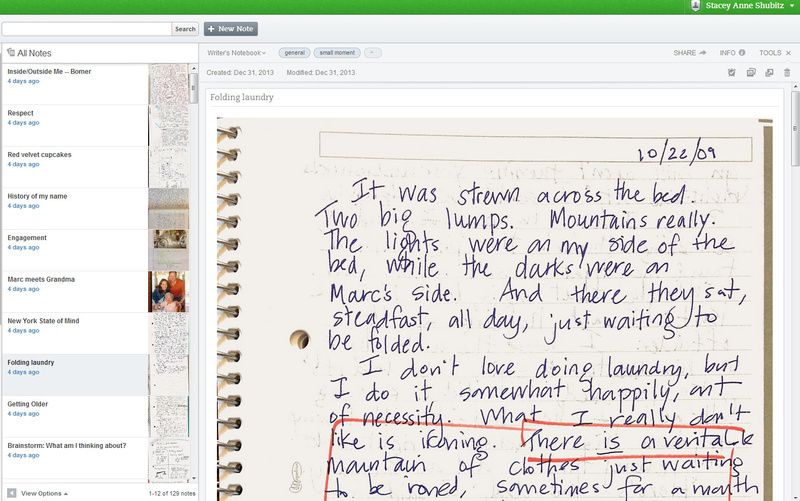 Are you aware that Evernote will also search handwritten notes? This may just be an Evernote Pro option and, if so, well worth the cost. For example, I just wrote myself a note and included the words “depth of knowledge”. I did not use fantastic cursive, just a quick note on the back of an envelope. Then in Evernote, I chose to create a note, used the app’s camera to take a photo of my scribble. I did this using Evernote on my iPad. I then went to Evernote on my laptop and searched notes for “depth of knowledge” and there it was, my hastily scribbled note with “dok” highlighted! How powerful is that?! I’ve been using the premium version since the summertime. Searching for handwritten notes is such a huge help (esp because I use Penultimate and the Post It feature on Evernote). Evernote will search your handwriting in the post-it feature? What stylus do you use with Penultimate? I’ve been trying to confer with Evernote and I’m still really slow with the process, but I think it’s a great tool and I want to keep trying. I’ve been using a ho-hum stylus that I don’t know the name of. I’ve been through two so far and I haven’t been impressed. I just ordered a Jot Script stylus in the Evernote store yesterday. I’m hoping that will give me more precision when I write. As I was reading and thinking what a great idea. Couldn’t you have students do the same thing? They could take a photo graph of their best work and store it in their notebook, it could then be shared with parents if the student wanted. In grade two, getting them to rewrite the piece of writing can be very time consuming. Thank you. I loved that session, too, & need to get more into my Evernote files. I like how you’re doing this, Stacey, with the photos & the tags. I thought I was going to have to transfer all the words instead of photographing. Thanks for the inspiration and follow up! I am always looking for new ways to use Evernote. Thanks for this great idea! I didn’t realize Evernote had a camera feature. I’ll have to look for that! I love this idea. I was just thinking about doing something similar with my chart collection. Brilliant! I have been struggling with how to reconcile online and print notetaking – never thought about taking photos of the print. DUH! I’ve been using Evernote for a variety of purposes, so this should be an easy new application. Sometimes I feel like using print with a nicely flowing pen, even though my handwriting is drastically declining in legibility; other times I want to use my computer with it’s comfy ergonomic keyboard so i can read what I wrote! May I link to this post from my blog? Thanks for asking! You may share the link. What a timely post. I was just checking- “Is this in my writing notebook?” before an entire week of writing next week. This will also push me to contine using Evernote an an organizing tool. Thanks so much for including the pictures and possible tags! What a great idea! 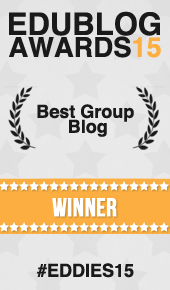 – We love Evernote for organizing everything else but didn’t think about it as a tool for consolidating notebooks. It would also be easy to add photos/artifacts that you want in your writer’s notebook as inspiration for writing.